We all at times want to turn the clock’s hands back so that we could do a lot of things differently. However, some say even if you backward and reset the things in motion again, not everything goes as per plan. 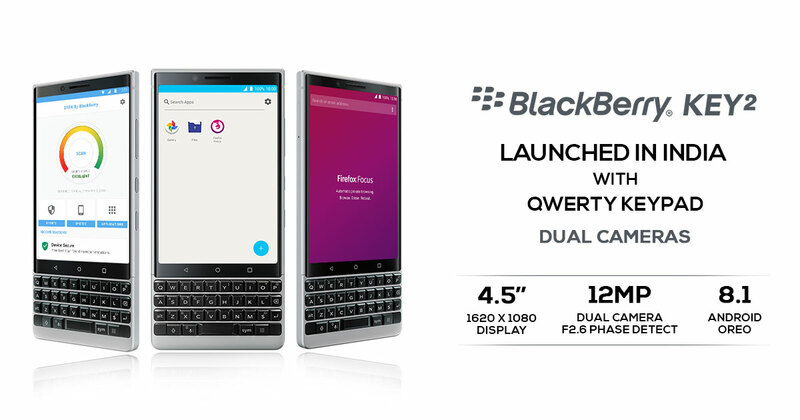 Blackberry Key2 is one such attempt by the yesteryears dominant player in the mobile handset arena. Following its last month international launch, the BlackBerry KEY2 made it to the Indian Market on Monday. In India, the handset is licensed by Optiemus Infracom. Let’s look at what’s new and what's old on the all-new BlackBerry KEY2. Added features include in-built DTEK, the Proactive Health pack. The enhanced Convenience Key seems to draw parallels with that of the Speed Key by Optiemus. Using it one can easily open the most-used apps. An alternative to the recently used apps features on standard smartphones. Textured Plastic diamond grip back panel. 3.5mm audio jack, power and volume buttons. A ‘Speed Key ‘ for automatic app navigation. At a time when bezels have made way for infinity display, the BlackBerry KEY2 makes a bold statement by sporting a physical QWERTY keyboard which does come equipped with intelligent shortcuts for launching frequently used apps as well as single key commands. But an all first dual camera setup on a BlackBerry Key2 is also a gentle reminder to rivals that the BlackBerry is not competing anymore. It is back to what it does best… “Creating A brand… A Following”. The 4.5-inch screen on the Key2 is full-HD (1080 x 1620 pixels) sports IPS LCD display with 2.5D Corning Gorilla Glass. It has an 3:2 aspect ratio with a pixel density of 433 ppi. The dual-SIM (Nano) Key2 promises true visual experience with 24-bit color depth. For the performance ratings, the BlackBerry KEY2 uses the services of 64-bit octa-core Qualcomm Snapdragon 660 SoC (four Kryo 260 cores clocked at 2.2GHz and four clocked at 1.8GHz), coupled with 6GB of RAM. It runs Android 8.1 Oreo out-of-the-box. The smartphone will be available in 64GB and 128GB internal storage variants, expandable via microSD card (up to 256GB). Back in its heydays, BlackBerry had lost its market dominance to the iPhone and the major driving factor was the touchscreen. This time around this could be the camera which his now a major sales driver across all smartphone segments. However, for BlackBerry, these are still early days. And dual horizontal camera setup with two 12-megapixel rear sensors will not disappoint. The horizontal arrangement at the rear also makes way for Dual Tone LED flash. Camera features include 4K video recording at 30FPS, HDR, and dual PDAF. The single 8-megapixel front camera offers fixed focus with screen flash and supports full-HD video recording. Connectivity options on the BlackBerry KEY2 include 4G LTE (on both SIM cards), USB Type-C, a 3.5mm headphone jack, Bluetooth v5.0 LE, NFC GPS, Wi-Fi 802.11ac (dual-band 2.4GHz, 5GHz), GLONASS, Beidou, and FM radio. A 3500mAh battery with Quick Charge 3.0 support promises 25 hours uninterrupted more than normal use battery life. Onboard sensors include an ambient light sensor, accelerometer, hall effect sensor, gyroscope, a proximity sensor fingerprint sensor (on spacebar key), and magnetometer. The 151.4x71.8x8.5mm dimension BlackBerry KEY2 weighs 168 grams.